There are times when I feel like I have my sweet tooth under control, but then I indulge in one too many desserts, and I’m back to the drawing board, craving sweets all the time again. The biggest problem I have is overindulgence. If I could stop eating a piece of cake after a few bites, I wouldn’t be so upset with my sweet tooth, but alas, I cannot. Recent research shows that after eating three bites of food your taste buds are bored, in other words, your sweet tooth is satisfied. But how many of us stop eating at that point? We know I surely cannot. 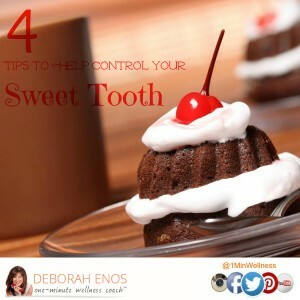 So, here are a few more realistic tips to help satisfy that sweet tooth. 1. Savor the flavor. Your sweet taste buds are on the tip of your tongue. With your first bite of dessert, let the food come in contact with the tip of your tongue. Also, smell your food before your first bite. Both of these techniques can help you to be more satisfied with fewer calories. Maybe we’ll be able to walk away with three bites after all. 2. Combine sweet and healthy. We know that too much added sugar is bad. So, if you’re having an indulgent dessert, consider combining it with something a little healthier. For example, if you’re having chocolate ice cream, add banana slices. The fiber will help fill you up and the sweetness will satisfy your craving. 3. Chew gum. I know, this seems like a lame swap. And it is. But it often works. Chewing on gum will give you a bit of sweetness while you ride out that craving. A 2011 Appetite study found that chewing gum can help squelch food cravings. 4. Go for a walk. When all you want to do is open the fridge and cut yourself a piece of cake, put on your sneakers and hit the pavement. The exercise will remind you of your fitness goals and why the cake is not the best idea you’ve had and it’ll help get your mind off of the craving.